Miss Universe Iceland 2016 Hildur Maria Leifsdóttir is an adrenaline junkie. Aside from playing Iceland’s national sport handball for 15 years, she is also into motorbike racing and snowboarding. This 24-year-old flight attendant from Kópavogur is the first Miss Iceland to compete in Miss Universe since 2009. Get to know more about her. The day I was born, I received a teddy bear as a gift and today 24 years later, he still sleeps in my bed and I take him with me almost everywhere I go! He means so much to me. How would you describe Iceland to your fellow contestants? It’s an extremely beautiful country filled with glaciers, volcanoes and waterfalls. You will find the happiest people there and in our society, men and women have equal rights. Iceland is said to be the most feminist country in the world. And of course, I can’t forget to mention the good clean air and freshest water in the world. Drink a lot of water! I also clean my skin every night and morning and to be positive about life. How you feel inside will shine through you. What has been the biggest disappointment in your life how did you deal with it? I play handball and have played for about 15 years. In 2014 I dislocated my knee, I thought my career was over. I had just come back from a broken hand right before the new knee injury happened and I thought I was not meant to play handball ever again. It’s extremely difficult to come back after knee surgery. But I decided that I did not want to quit and I would work hard and get back on the field. I started working on the strengthening the knee before the surgery so my recovery from surgery would be quicker. About 4 months later I had the surgery. It took me 21 days to go to the gym again, 2 months to wear heels, less then 3 months to go out for a run and less 10 months later I was back in the game. My mind was in the right place, I knew what I wanted, I worked really hard to get my goal and so I did. 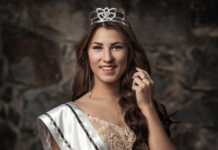 What made you decide to participate for the Miss Universe Iceland competition? We have heard that you sent your application one day before the deadline. Yes that is true! I became aware of the competition through social media so I was very curious but I never thought I would apply. Then my friend said that she wanted to participate so I got a little bit excited and thought I should too, it would be a fun experience to share with a good friend. Ultimately my friend told me that she couldn’t participate in the competition so I thought I’m not doing it alone but then on the last day I just said to myself I’m doing it … it’s going to be so much fun and boy I did have fun and much more than that! How have you been preparing for Miss Universe 2016? Immediately after I won, I went straight to the United States to meet my sponsors for Miss Universe. It was amazing, I received so much great advice, and was able to put together a wonderful wardrobe, did a photo shoot, met with fitness and stage presence consultants. I truly have the best team and humbled all these people are willing to help me prepare for the competition and for me to be my best self. Back home in Iceland I have been working out to keep me fit and eating healthy, working on my walk and interview. Miss Universe is very keen on the national costume, traditionally being the first round of the competition. Tell us something about your national costume, and what is the meaning of it? Well I want to keep an element of surprise for the national costume competition but I can tell you that it is being designed by Alberto Ravelo in Miami, Florida, USA and will be a fantasy interpretation of what Iceland is mostly known as…the Land of Fire Ice! If you become the next Miss Universe, what will you do with the crown and title? In addition to taking on the role as a global advocate for HIV Prevention and AIDS Awareness Research, my motivation is to share the message of women’s empowerment. I was born and raised in a country where women are viewed as equals in society. Iceland is a very progressive society and I would love to share our story with the world. Specifically, I would love to focus on the rights of women to an education, something that many women struggle with in their respective countries. I hope to be an ambassador that truly will show women that believing in yourself, setting goals and creating a path to achieve them is possible for everyone. What qualities do you think will enable you to shine at Miss Universe? My qualities that I hope the world will see is that I’m a very kind and loving person, also that I have a very positive mindset and I always try to put the need of others first before me. I have always had this need to help people especially those who are less fortunate. I have been that way all my life. I am also very sincere and the people that are closest to me know that, but I hope I’ll find a way show the world the true qualities that I have. I have been overwhelmed by the love and support given to me thus far. After a 7-year absence at Miss Universe, I am honored to represent Iceland again at the most prestigious pageant in the world. I love traveling, having most recently been to Bali, Indonesia this past summer, and I cannot wait to be in The Philippines! Southeast Asia has the most amazing people in the world. To all my fans and supporters, THANK YOU for believing in me and I hope to make you proud! Mabuhay.